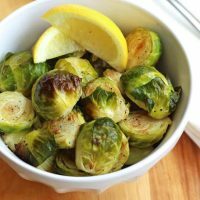 Toaster Oven Roasted Brussels Sprouts, simple step-by-step directions for making deliciously tender yet toothy coconut oil roasted Brussels sprouts. That pound of fresh Brussels sprouts was so enticing at the farmers market this morning. But now, with 30 minutes until your sweetie will be popping into the kitchen hungry for dinner, you’re not so sure. Don’t Do It! 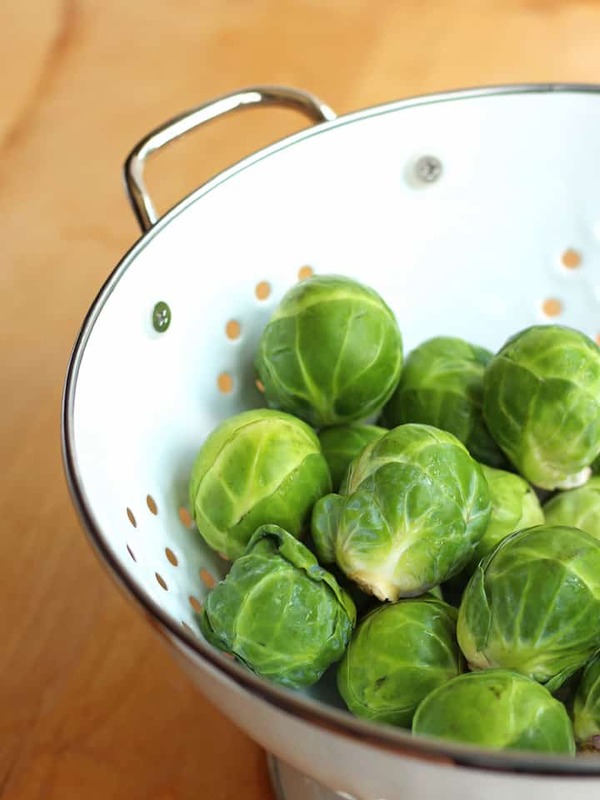 Yes, steaming and boiling are quick and easy but can end badly with soggy overcooked sprouts and a disgusting sulfur smell in your kitchen. 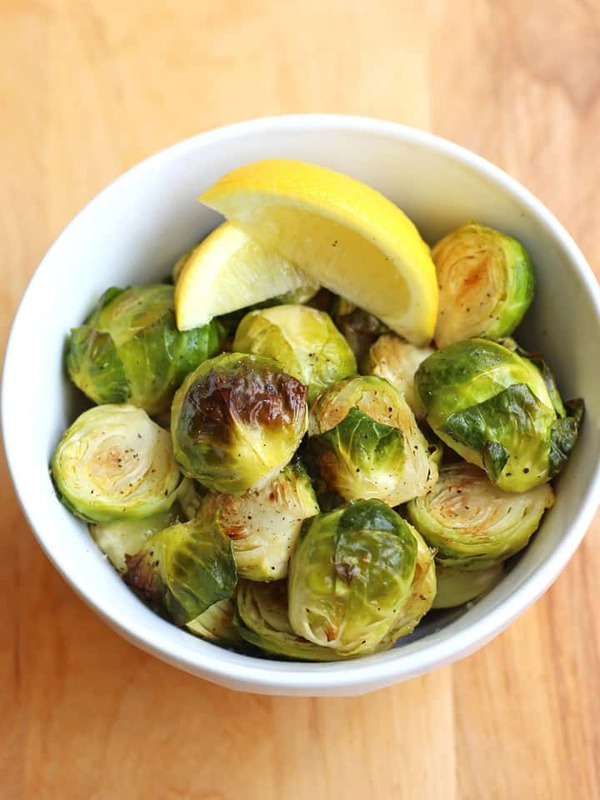 Roasting Brussels sprouts at a high temperature with coconut oil will caramelize them. Bringing out their natural sweetness while keeping them tender yet toothy. No mushy sprouts allowed here! And if you’re only cooking a small batch for two, your toaster oven is truly the right machine for this tiny veggie roasting job. Preheat your toaster oven to 425ºF and grab a roasting pan or rimmed sheet pan small enough to fit in your toaster oven. Wash and dry the Brussels sprouts. Trim off the stems and remove any browned or discolored leaves. Then slice each sprout in half. 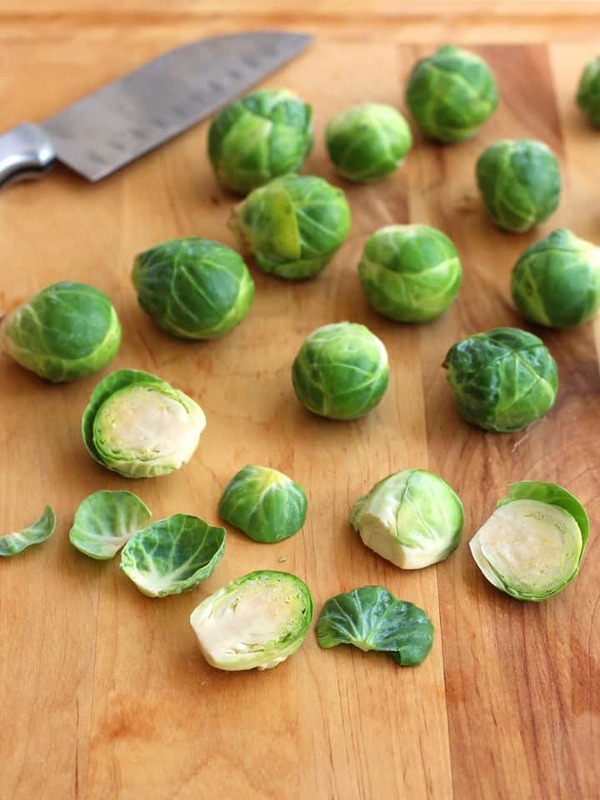 Slice any larger sprouts into quarters. Just like when making Jalapeño Roasted Cauliflower and Spicy Sriracha Roasted Red Potatoes if everything is similarly sized the pieces will all cook at the same rate. 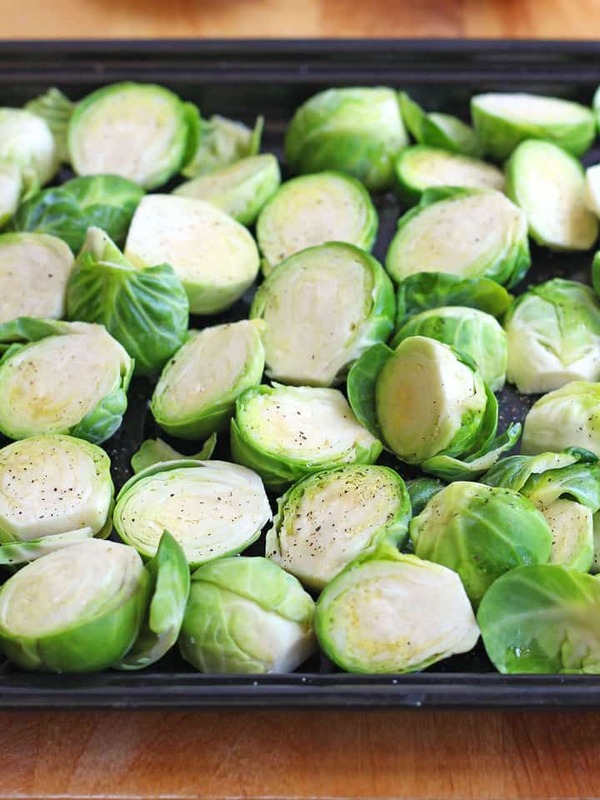 Place the sprouts on the pan and drizzle with melted coconut oil. Season liberally with salt and pepper. Then toss the sprouts well to get all of the pieces evenly coated ← I like to use my hands for this part. Roast at 425ºF for 20 to 25 minutes depending on how large your sprouts are. Stir the sprouts about halfway through the cook time. Sometimes I use a fork to carefully turn each sprout so its interior is facing down onto the pan. 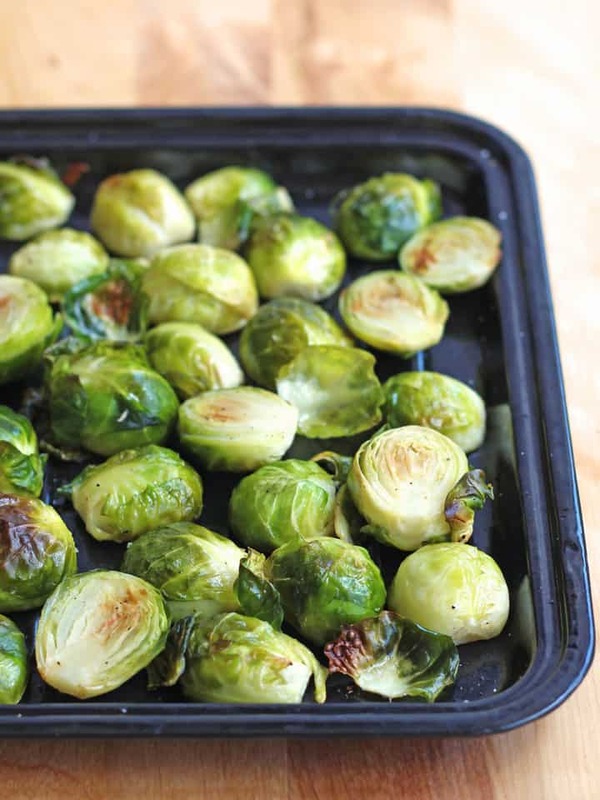 When ready, the sprouts will be lightly browned, caramelized and fork tender but not mushy. Serve them plain, with lemon wedges, dressed with Sriracha Vinaigrette or your favorite topping. You may get a few crispy loose leaves on your pan, don’t toss them out they have a ton of flavor and a unique texture like a Brussels sprouts chip. Now wasn’t that easy? And since you’re basically a veggie roasting pro now, want to try something slightly harder…how about Toaster Oven Roasted Beets or Cooking a Spaghetti Squash in Your Toaster Oven? 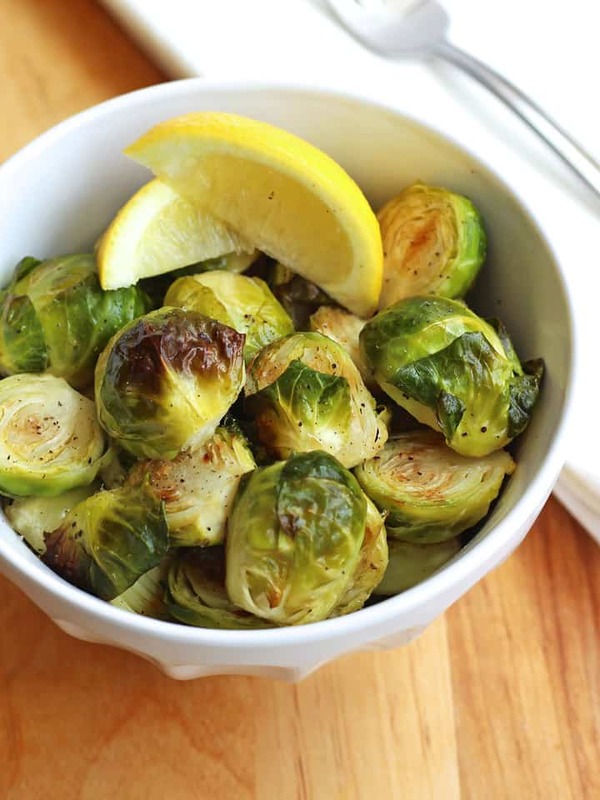 Delicious tender-yet-toothy toaster oven roasted Brussels sprouts. Preheat your toaster oven to 425 F and grab a minimum 10 x 10 roasting or rimmed sheet pan. Wash and dry Brussels sprouts. Trim off any stems and slice each sprout in half. Place sprouts on pan and drizzle with melted coconut oil. Sprinkle with desired amount of salt and pepper. Using your hands toss sprouts well getting them all evenly coated. Roast at 425 F for 20 to 25 minutes depending on how large your sprouts are. Halfway through cook time stir sprouts and using a fork carefully turn sprouts so their interior is facing down onto the pan. Sprouts will be browned, caramelized and fork tender but not mushy when they are ready. Serve plain, with lemon wedges, sriracha sauce or your favorite topping.